Hamid is trapped. Ant is cursed. Herobrine's rampage begins. Fresh from their victories in the Overworld and the Nether, Hamid, Jaina and Ant must now face their greatest challenge: Herobrine's invasion of the real world. With Hamid trapped in the End and Ant still under the cont... read full description below. Hamid is trapped. Ant is cursed. Herobrine's rampage begins. Fresh from their victories in the Overworld and the Nether, Hamid, Jaina and Ant must now face their greatest challenge: Herobrine's invasion of the real world. 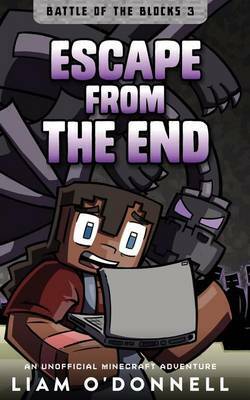 With Hamid trapped in the End and Ant still under the control of the Alpha Slime, it's up to Jaina to stop the army of endermen and zombies pouring out of Minecraft and onto the streets of her hometown. Lost and alone in the End, Hamid searches for a way out, finds new enemies and makes a deal with a monster that could destroy them all. Grab your pickaxe, the final fight in the Battle of the Blocks draws near . . .
Liam O'Donnell is an award-winning author and educator. He has have created about 40 graphic novels and books specifically for reluctant readers, including: Max Finder Mystery, Graphic Guide Adventures, Geeked Out Mysteries, Tank & Fizz, Battle of the Blocks. and West Meadows Detectives. He is also an educator who has taught in Kindergarten to Grade 8 classrooms in Canada. In nearly a decade of teaching, he has focused on getting children reading through alternative literacies, like graphic novels and video games. He lives in Toronto, but you can visit him anytime at: liamodonnell.com. Join his Reading Change Readers Group and get a free ebook, reluctant reader resources and project updates. You can also follow @liamodonnell on twitter where he tweets about reading, writing, games and other geeky stuff.